If za’atar is within reach, anyone can make delicious food at the drop of a hat. The possibilities are endless: Za’atar Olives, Za’atar and Labneh, Za’atar Tomato Sauce with Grilled Meat, Za’atar Bread, and Za’atar Pizza are only a few ways to use this versatile ingredient. I almost have my Za'atar Chicken recipe ready to post. Za’atar (ZAHT-ar) is a class of herbs, and includes members of the thyme, oregano, and savory families. Za’atar is also a Middle Eastern herb blend, containing one or more of the za’atar herbs. As with many centuries-old dishes, za’atar blend has many regional and familial variations. Disparity in za’atar’s spelling is pervasive; za’atar, za’tar, zatar, zahtar, satar, zahatar, and za’ater are all used. The spelling confusion is easy to explain. Za’atar is an Arabic word (الزعتر). Like Greek and other languages that don’t use the Roman alphabet, Arabic is inconsistently transliterated into English. Some experts claim the herb za’atar is only one specific type of savory; others claim with equal vehemence it’s one specific type of oregano. Both may be right, but only for the region or family they’re writing about. No matter its local or historical usage, “za’atar” has come to be a generic term used in the Middle East for a group of similarly-flavored members of the herb genus Lamiaceae. Za’atar herbs grow in the same habitat and have similar appearances. These practical factors may have led Middle Easterners to use one word for all the plants. There are also several varieties of commercially available za’atar blends. For example, according to Paula Wolfert, “The taste of a za’atar mixture can be herbal, nutty, or toasty. …’Israeli’ is a pale green blend of pungent herbs that includes the biblical hyssop, along with toasted sesame seeds and sumac. The ‘Syrian’ blend, the color of sand, has a decidedly toasty flavor. The ‘Jordanian’ blend is dark green and very herbal, with some turmeric.” These aren’t the only za’atar blends; each spice merchant and family has a unique formula. Before creating my own za’atar blend, I bought and tasted several commercially available varieties. I experimented with diverse combinations of herbs trying to best approximate the flavor of my favorite commercial brand. I also read as many English-language za’atar recipes as I could find. For the herbal flavor in za'atar blend, many North American recipes use only dried domestic thyme, or a mixture of domestic thyme and domestic marjoram. These recipes, when tasted side by side with imported za’atar blends, tasted bland to me. I discovered that Greek oregano (preferably, but not necessarily, wild-harvested and sold on the stem) is key to creating flavorful za’atar in Alaska. Greek oregano’s spicy flavor, when tempered by combining it with dried wild or domestic thyme, approximates the flavor of authentic za’atar blend. For anyone interested in growing their own, the various plants referred to as za’atar can be purchased from Well Sweep Herb Farm or Mountain Valley Growers. Although they’re tasty, keep in mind that most domestically grown herbs don’t have the flavor of their wild progenitors. There’s nothing like scarce water, poor soil, and hot sun for developing flavor. For those who live where there are Middle Eastern markets or specialty stores, by all means buy ready-made, preferably imported, za’atar. You can also order za’atar blends online. 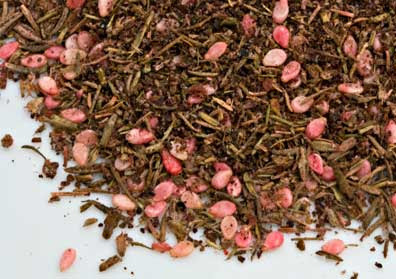 In Anchorage, you can buy sumac, a key ingredient in my za’atar blend, at Sagaya, City Market, and Summit Spice. Summit Spice sells its own Anchorage-made za’atar blend in tiny packets using marjoram, thyme, sumac, and sesame seeds. Summit also has a product labeled “Greek oregano,” which they tell me may be grown on farms in Greece or Turkey, depending on the shipment. Because za’atar has so many uses, I make a lot at one time: 1/2 cup oregano, thyme, and sumac, 1/4 cup sesame seeds, and 1 Tbsp. salt. The sumac, which has a sour taste akin to lemon, is what gives za'atar its red color. Grind the oregano and thyme in a spice grinder or blender, making sure it’s free of sticks and stems. Put the herbs in a glass jar with a tight sealing lid. Add the sumac, sesame seeds, and salt and shake well to thoroughly combine. Put on the lid and close it tightly. Store away from heat and light. Made entirely with pantry staples, Za’atar Olives are easy to prepare and make a great last-minute appetizer. Especially when warm, Za’atar Olives are an addictive treat. Rinse the olives and dry them well. Put the olives and olive oil in a small saucepan, bring the olive oil to a simmer, and simmer the olives for 15 minutes. Stir in the Za’atar Herb Blend and simmer for 5 minutes. Serve warm or at room temperature. When I have breakfast with Marie, an Armenian friend who was born and raised in Beirut, she always serves Mana’eesh, olives, tomatoes, cucumbers, and cheese. Breakfast at Marie’s was my first introduction to za’atar; it's been a part of my repertoire. To make it from scratch, I use my Palestinian friend Salwa’s recipe for pita bread, and top it with Za’atar Herb Blend and olive oil. Although Marie serves this for breakfast, we eat it for a snack, for lunch, or as part of an appetizer spread. If you’re cooking for a small family, like I do, use half the dough for Mana’eesh and the second half for Za’atar pizza (see recipe below). Make the Dough: Place the water in a large bowl. Sprinkle the yeast over the water, sprinkle the sugar on top and let sit for 10 minutes, or until the yeast begins to foam. Mix in the salt and half the flour. Add the rest of the flour one cup at a time, just until the dough holds together. Knead the dough well (either by hand or in a standing mixer), adding flour as necessary until the dough is smooth and shiny. You may need more or less flour than called for in the recipe. Put the kneaded dough in an oiled bowl to rise, cover the bowl with plastic wrap and a dish towel, and put it in a warm spot. Let the dough rise for 1 hour, or until it has doubled in size. Divide the dough into 12 pieces and pat each piece into a 6” round flatbread. 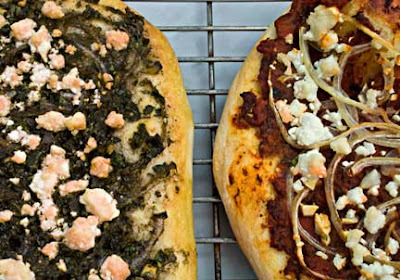 Place the flatbreads on baking sheets with rims; 6 dough rounds fit on a half-sheet pan. Use your fingers to dimple the tops of each flatbread. Let the flatbreads rest for 20 minutes. Make the Topping: Mix together the olive oil and Za’atar Herb Blend. Assemble and Bake the Flatbreads: Dimple the flatbreads one more time. Divide the topping between the flatbreads, about 1 Tbsp. each, and spread it evenly over the flatbreads’ tops. Bake the flatbreads, one baking sheet at a time, for 8-10 minutes, or until the flatbreads are golden. Serve immediately. Note: Mana’eesh can be made ahead and rewarmed just before serving. To rewarm, stack the Mana’eesh, topping side to topping side, and wrap in aluminum foil. Put in a 300°F oven for 5-10 minutes, or until they are warmed through. Plain Labneh goes really well with Za’atar Flatbreads. For garlic fans, mix 1-2 cloves puréed garlic into the cheese (an easy way to purée the garlic is with a standard Microplane rasp grater). Usually, I let the yogurt drain into the sink. If I’m feeling ambitious, I let it drain into a bowl and use the liquid to replace some of the water when I’m making bread dough. Line a strainer with a paper towel. Mix a little salt into the yogurt and dump the salted yogurt into the paper-towel-lined strainer. Let the yogurt drain for 4 hours or overnight. 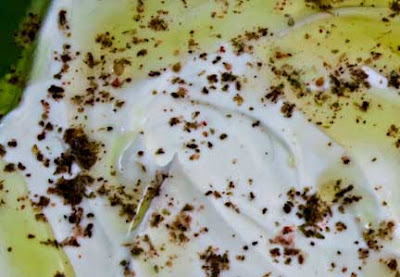 Spread the yogurt on a plate, sprinkle with Za’atar Herb Blend to taste, and drizzle with olive oil (if using). Serve with crackers, pita chips, or triangles of pita bread. Extra Za’atar Tomato Sauce is a great way to dress up grilled chicken, lamb, or pork (see recipe below); it also may be frozen for future pizzas. The amount of Aleppo or red pepper depends on how spicy you like your food. 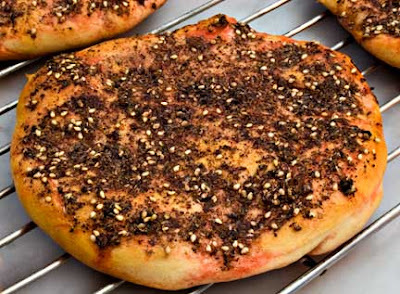 Pick either Topping#1 or Topping #2 or, if you want to try them both, make the full amount of Za’atar Flatbread dough. Shape the Pizzas: Shape the dough into a 12-15” round; the exact size depends on how thick you like your pizza crust. Place the dough on a pizza pan or baking sheet with rims. Use your fingers to dimple the top of the pizza, and let it rest for 20-30 minutes. To Make Topping #1: Mix together all the topping ingredients except the crumbled feta. To Assemble Pizza with Topping #1: Spread the topping mix over the pizza. Sprinkle the crumbled feta over the topping. To Make Topping #2: In a saucepan, mix together the tomatoes, garlic, Za’atar Herb Blend, Aleppo pepper, olive oil, and water or wine. Bring to a boil, turn down the heat, and simmer for 15 – 20 minutes, or until the sauce is very thick. Taste and add salt or freshly ground black pepper, as needed. To Assemble Pizza with Topping #2: Spread half the tomato sauce over the pizza to cover it (use more if you like saucy pizzas). Save any extra tomato sauce for another purpose. Evenly distribute the onions over the tomato sauce and sprinkle with crumbled feta. Bake the Pizza: Turn the oven down to 450°F. Bake the pizza for 25-30 minutes or until the crust is nicely golden. Serve immediately. 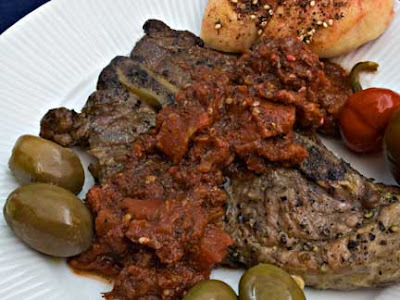 Za’atar Tomato Sauce goes equally well with grilled lamb or chicken. 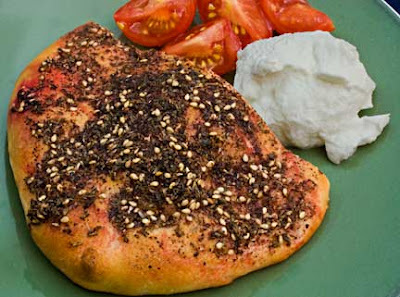 The sauce is identical to the one used for Za’atar Pizza (see recipe above). For the same reason that brining improves the flavor of pork chops, salting meats well in advance of grilling makes them taste much better. If you can only find large pork steaks, buy 2 and cut them in half. Prepare the Meat: Rinse the steaks and dry well. Season both sides with salt and plenty of freshly ground black pepper. Let sit at room temperature while you make the sauce. Make the Tomato Sauce: In a saucepan, mix together the tomatoes, garlic, Za’atar Herb Blend, Aleppo pepper, olive oil, and water or wine. Bring to a boil, turn down the heat, and simmer for 15 – 20 minutes or until the sauce is the thickness you prefer. Taste and add salt or freshly ground black pepper, as needed. Cook the Meat: Grill the pork steak over a medium hot fire or in a grill pan on top of the stove. Turn the meat regularly until it is just done; be careful not to overcook it. Serve immediately with Za’atar Tomato Sauce spooned over. 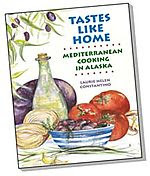 This is my entry for Weekend Herb Blogging, which I am hosting this week at Mediterranean Cooking in Alaska. wow, a post with so many punches, i'm knocked out. What a great post -- with so many interesting and delicious looking possibilities from the spice blend. I, particularly, like the addition of sesame seeds. Fabulous post! I remember the first time I tasted za'atar. It was at a Lebanese festival, and some men were making za'atar pizza on top of an old metal drum sitting in a wood fire. They would slather the dough with oil, and then spread the za'atar with their hands on one side. Slap it onto the hot drum, wait a minute or two, and it was done. I had cravings for weeks afterward. Za'atar has so many uses as you have shown in your post. I used to think za'atar only meant "thyme" or "kekik", but a while back, a friend mentioned that za'taar is a combination of herbs which is sold in one of the stores around here. So I realized it can mean different things. When mixed with olive oil the taste is heavenly I was told. I like the za'tar in the olives. 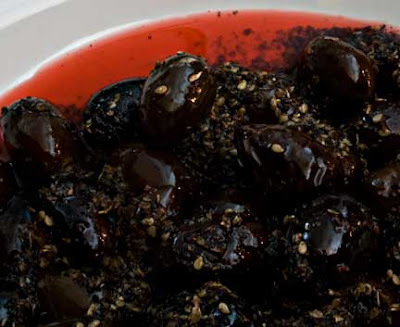 In Turkey, we prepare olives with thyme and olive oil for breakfast instead of appetizer. Great post, as always. I LOVE zaatar. My favorite application is probably something like your delicious looking flatbread, but I also just love it rubbed on chicken with a little olive oil & lemon juice before it's cooked. Everything here looks so great, I really want to make the olives! Fabulous post! I love Za'atar however you spell it, but I didn't know half this stuff about it. Wow! What an educational post! I've never met za'atar but your recipes sound so good I want to! I love it that you give a recipe for the za'atar itself, rather than just how to use it. What a fascinating post! I was not sure what za'atar was when I would read it - but now I know. I will be investigating what is available at our international market, and then attempting my own blend. We make pizza in a brick oven and I'm sure za'atar pizza will be a big hit. Thanks! I am completely smitten by this post Laurie! I have a special place in my stomach for savoury breads like naan, chapati, roti, focaccia breads and other savoury flat breads. Funny how bread always manages to leave my stomach and end up on my hips :D The za'tar pizzas and flatbread look incredible! I recently made a purchase from the World Spice Merchants on-line and I'm eagerly awaiting my dukka mix among others! Thanks for introducing me to this spice site. It's very inspiring! Your posts are never stingy...most would stretch out these recipes. Zaatar sounds like a wonderful flavouring for Lagana. Maria, if you can make this with both wild thyme and oregano it's even better. The pinkish bits are the sumac. Joan, I like the toasty flavor of the sesame seeds. Oh my, Lydia, does that ever sound good. Wow, I want some of that. Val, it must be the season! Elly, yes, it's wonderful with chicken. I'll have my version of that as soon as I get around to typing it. Lulu, I'm glad you like it! Cora, wow - pizza in a brick oven?? You are very lucky! Bijoux, why is it that bread likes to land on hips?? It's so wrong. I'm glad you found World Spice - they are very helpful people (and sell such good quality products). Yeah finally a use for that giant bag of sumac I bought because going through the grocery store hungry tends to lead to so many odd purchases. I've wondered what zatar is but had never done the research. This answers a lot of questions and it definitely sounds like something fun to play with. All those applications (the flatbread and pizza are my fave) look delicious! I am so impressed by your post on zaatar! I am doing a giveaway on my blog that includes zaatar and if you don't mind I will link to this article, as I promised to include a booklet of recipes with the goodies to the winner. I love zaatar, eat it every day!